The acts of painting and drawing are inseparable for me. The surfaces may change from canvas to paper, colours from black to a variety of colours, but the act of drawing is always visible. Sometimes I draw directly on the surface, other times I draw into a surface which has the paint already applied to it. I work this way because the actions of painting and drawing are physically very important to me, whatever the subject might be. The actions of working heighten my awareness and control of my body, which I see as an instrument of expression and perception. I think this is why viewers often comment on the energy shown in my works. 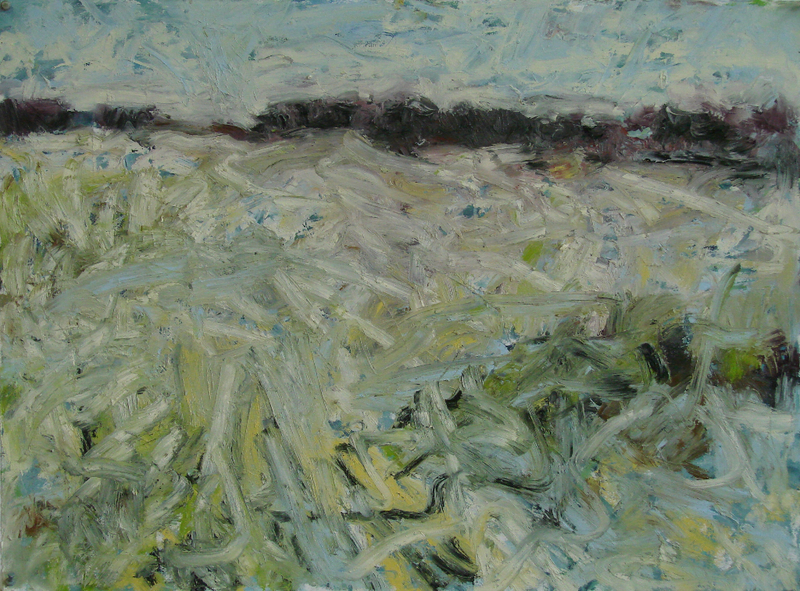 I paint landscapes because I see them around me, because the land supports us and feeds us. I make still life paintings because I love the shapes of hand-made containers and the simplicity of grouped fruit, vases, and flowers. 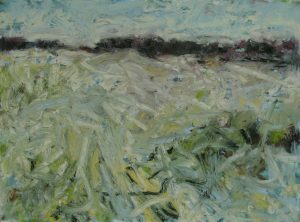 I sense the energy of the landscape and still life groupings and work to keep that energy visible in my paintings and drawings. The annual spring sketching trip to Charlevoix was a renewal for me! In Montreal I’m committed to my background as teacher at Dawson, occupant of a large studio, attender of many vernissages, acquaintance of many artists, researcher of art books and critiques. These groups/activities foster knowledge about the art world, but the Charlevoix painters paint together, which is unique. There is something very special about a long-established art group painting plein air. They are all supportive of each other. And we all feel that we learn something from the experience, and that’s far more important than the canvases we take home with us! For me, this trip was a push towards uniting my observations with my feelings for necessarily more abstract compositions. Making a preliminary sketch to help me find the composition proved immensely helpful, but it happened not because I forced the composition but because I just started the ink drawing and gradually found, in the process, the composition. Then, working largely from the sketch, but with the scene there for reference, and with the irreplaceable push from the physical specifics of being out of doors in April, I could work on the painting and let the painting itself develop, not just the scene. I am quite thrilled with the way it went. I can’t always see in my finished paintings what I have accomplished, at least not immediately (and I don’t understand why this is), and it’s great to have the positive response of the others in the group. The gallery owner in Magog saw the works on my way back to Montreal, liked them very much, using the word “superbe” to describe the 16×20” on which I scrambled the thick paint into a “feeling” about the scene. Going forward with painting is a challenge. It’s far too easy to let influences of past work, or of work done by others, creep into what you are doing NOW, a NOW that must be both personal and contemporary. You can’t paint in the future – the most you can really do is to get to NOW. And being at NOW means leaving a lot of other stuff behind in the past. It’s not all forgotten, it’s just already digested, and I’m into cooking a new meal that will please my sensual taste buds, and those of my guest viewers! With food, the proof of the work is in the eating of it when it’s ready, and in painting it’s in the complete visual satisfaction when it’s finished for viewing and contemplation. There is a time when recipes and rules run out – to be in the NOW has its special characteristics that you’ve just added. It works, and you know it! And it feels honest and it feels contemporary. To paint is to re-make! It is to take a subject or idea or feeling and capture it with colours and textures and shapes. We remake what is called the real world into a much larger reality that can be intuited and approximated and suggested and deeply felt in a successful work of art. It’s not only invention – it incorporates and remakes the rest of our world in a subtle and sensitive way. The work of doing this is totally engrossing! This is not a literal transcription of anything. It underlines the necessity of having a life, a well-rounded life of experience and curiosity and knowledge, so deeply felt that it naturally permeates all our creations. Painting in that sense is the re-making of our life into a form that can be understood visually by others. Colour is exciting, refreshing, joyful, and fulfilling. The trick is to get it right, on track with the right feelings, textures, subjects, and ideas. The key word is exciting, which is not to be confused with chaotic enthusiasm. It’s more thrilling than that, the soul-saturating fullness of completeness. Great colour is quiet exuberance! It arrives almost before the painting does, with some unexplainable ping of recognition in a subject, a view, a stream of light, a visual event, or a vision. Then it has to get carried into the painting, the process, the choices of colour, the concentration, the exclusion of all distractions, until the painting itself works as a total event on its own. Quite something to achieve! Enthusiasm carries more paint to the canvas than brushes or any other utensils! To have enthusiasm for life is positive, and that’s a true challenge. It means staying far from prettiness and insipid colours, and yet veering away from the depressing subjects and colours that come to mind when we listen to worldwide news events. And it’s a cop-out to simply manipulate paint all by itself – it would be more fun to work at finding a new colour for a paint supply company. A positive enthusiasm comes from having a vision of the world that would be better to live in than the world we simply adjust to every day. Artists see further and deeper than events, and enthusiasm is the vehicle they take to do that. Changing subject or medium is seen by many people as almost the same as changing style. It’s no wonder artists head into the extremes of high realism or repeated variations on an abstract theme. How else to be known as consistent, which seems to be a “wanted” option. Only with artists who self-profess to be varied and talented experimentalists will stylistic wandering be tolerated, as it is with Anselm Kiefer and a few others. It may be career-offensive for a while, but in the long run it allows the artist to grow even better!